Disclosure: I received no compensation for this post. I am just sharing to help animals in need and one of the charities I support. As a rescue kitty myself I want to help other rescue pets find their forever home, so each week on Charity Tuesday I share adoptable cats from Wood Green, the Animals Charity (which is where I was rescued). Mum and I are so grateful to this amazing charity because without them we would never have found each other! Please note however that this post does contain some affiliate links. This means if you click on the Zazzle links to purchase any of the items featured, I will receive a small affiliate commission which I won't keep for myself but will donate to animal charities. Read full disclosure policy here. As you can see, we have another Greek goddess on the blog today. But I promise that you won't see any sibling rivalry here as I'm going to be nice today. You see, as a rescue cat, I've agreed with Mum that our mission is to help other rescue cats. 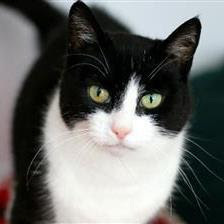 Artemis is a pretty black and white cat who "marches on the spot and loves a fuss". She likes a quiet household but also enjoys exploring the outdoors. True to her name, she is a talented hunter who will reward you with presents! To find out more about Artemis visit her profile. Or watch her on YouTube. Artemis is a beauty. I love that they do videos for their adoptable cats. Artemis is going to win over her forever humans in a snap! What a pretty girl Artemis is!